As GMs, we create entire worlds, adventures, and characters in broad strokes, leaving the little details to sort themselves out when the time is right. But sometimes the little things need a little nudge... Little Spaces offers a splash of inspiration for a particular space for just such an emergency. 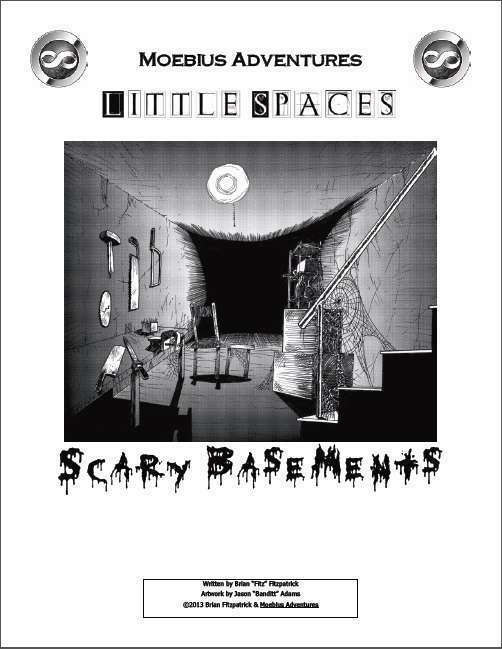 This supplement offers a collection of three random tables to offer inspiration to describe a creepy basement. What sense do you use? What sort of element are you describing? And how does the element appear? "The rusted toolbox is full of an odd assortment of hammers and screwdrivers, but as you're feeling around in the box you notice that several of the tools are sweaty when you touch them... and it's not your sweat!" More than 10,000 different combinations of factors can combine to inspire a creative masterpiece so creepy and evocative your players may wonder if YOU are the serial killer, monster, or psychopath hiding in the basement! This is the second in a new series of short (2 page), system-neutral supplements from Moebius Adventures designed to inspire more creative descriptions in your games.